Feeling the cold kicking in? Man up! 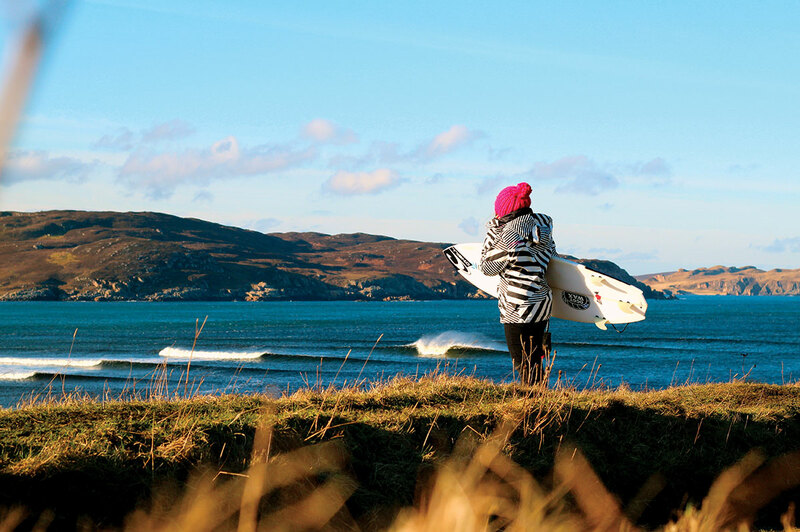 Dee ripoll has been surfing way colder! Living on the north east coast of Scotland isn’t all bad. After travelling all over the world, I always come back to the same conclusion that when the winter waves are pumping and the sun is out, there is no better place to be. Surfing in the winter here can be pretty brutal but it’s pretty special sitting in the line up when there’s snow falling all around you. Thurso trips are a highlight. I’ve been up a couple of times already this year and believe it or not, it’s actually a bit warmer up there with the Atlantic currents. Thurso is a four hour trip from Aberdeen and always worth it when you get there, but the lure to move up there becomes more tempting after each trip I do. There are reefs, beach breaks and point breaks, and if you don’t mind surfing in a wetsuit and getting mild hypothermia, you can’t want for much else. The winter is when we get our best waves, so even though it gets super cold there’s a bunch of locals in Aberdeen, Fraserburgh and Thurso who you will always see out in the water. It’s great to see more girls braving the harsh conditions up here too. There are a few girls who’ve been embracing the cold for years before me and really inspired me to start surfing – like Jill from Fraserburgh, Shona from Thurso and Sarah in Aberdeen who are still always out charging on the cold days. We’ll all be out even when some of the guys have hung up their suits until the water heats up a bit. The best thing for keeping warm is having good equipment, otherwise there’s no point in even paddling out. I wear a 6mm O’Neill suit which is surprisingly flexible for so much rubber, and built-in hoods are a necessity in my opinion- I couldn’t last without one in the winter. I think some guys worry too much about the lightness and flexibility of their winter suit. For me, it is all about warmth and comfort because if you’re body isn’t warm, it won’t perform at its best. Plus the warmer you are, the longer you can stay in and the more waves you will catch. I’m using 7mm boots and gloves right now and can usually last up to three hours in the water. I usually take a thermos to the beach and pour hot water down my suit when I come out. I’m pretty lucky because I live five minutes drive from the beach so I drive home in my suit and lie in a hot bath for a while before I take it off! Some of my mates pee in their suit and they say it warms them up. It’s not true – it warms you up for a minute but once that wears off, you feel the cold even more. Plus it makes your suit stink! Vans are amazing – like a portable changing room. It beats trying to get changed on the roadside and losing your towel to the gale force winds. Winter days are short up here and with a career change, I am pretty lucky that I’m able to surf during the week, while it’s still light. The long winter nights can get to you a bit, but drumming, writing songs and having band practices with my band Evera keeps me occupied. It’s nice to sit and chill in front of the fire too. I’m not going to lie; it feels amazing to surf in a bikini and chill on the beach all day in the sun. I love trips away to warm places just like anyone else does and it’s great to ditch the neoprene for a few months of the year, but there’s not many places I can say i’ve sat in the line up in between soaring cliffs and looked over to see a snow topped mountain with only a couple of other people surfing perfect waves with me. Nothing quite beats surfing with my friends in the homeland. This article orignally appeared in article 212 of Wavelength.